Our big family vacation was planned on the same week as Precious’ first birthday before we knew she existed, but it worked out great to have her aunts, uncles and cousins from my side (who all live in Eastern PA) to be there to celebrate with her. I had no intentions of having a BIG first birthday celebration for her, because I like the idea of keeping birthdays for little ones as small family get togethers. We kept it super simple with homemade cupcakes (decorated by Jason and me), party hats, blowers and balloons, and a special handmade banner that I sewed a few days before our trip. It says “HOORAY” so we can use it for many occasions in the future. Precious, who loves music, looked at us very strangely as we sang Happy Birthday. The majority of us can’t carry a tune, so… Sorry, Baby. She also got all sorts of neat gifts. This photo-dump is to document and give thanks where it’s due! Thank you, Grandma and Grandpa, for the puzzle and neighborhood wagon! Thank you, Uncle Jeff, Aunt Jess and Iris, for the Eric Carle books, wooden Costa Rica puzzle and the play breakfast set! Thank you, Uncle Aaron, Aunt Laura and Eli, for the new clothes and pull frog toy! Party cousins: Eli and Iris. My brother Aaron and his boy Eli. My sister Jess and her girl Iris. My sibs and their families had to leave the day of her birthday so we had a little bit of celebration the next day, too, on Precious’ actual birthday. 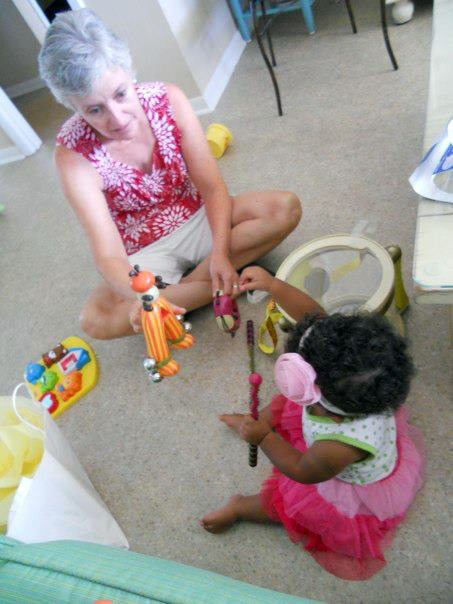 We gave her a set of musical toys. Thank you, Uncle Steve, Aunt Char and Aiden for the gifts you sent. She LOVES My Pal Violet and she’s getting the hang of the sippy cups. When Precious joined our family at 2 months old her toenails were painted green. After I took that off, I decided then that I’d wait until her first birthday to paint her toenails again. Light pink! And one last photo…Jason and Precious waiting for her birthday dinner on our last night of vacation. Happy Birthday, Ali-gator! I hope you enjoyed your celebration. We love you so much! This entry was posted on Tuesday, July 31st, 2012 at 8:00 am and is filed under Family, Family: Jason, Family: Me, Family: Precious/Ali. You can follow any responses to this entry through the RSS 2.0 feed. You can skip to the end and leave a response. Pinging is currently not allowed. Such a neat birthday party!! Love it and miss you guys. Glad you all had a great time. What a perfect party for such a gorgeous little girl! Our kids have the pull frog too and they absolutely LOVE it! It still gets played with all the time even though they are going on 3 and 6. How did I miss this?! Happy Birthday Ali!!! !